Shop’NCook Pro users ask me often if they can use the software for food labeling purpose or if they still need to send their food to a lab for analysis. There is no easy answer. The accuracy of the calculated nutritional analysis depends on the type of food you are labeling. Calculating the nutritional analysis from the ingredients works well for preparations with little processing of the ingredients. It is not adapted for some cooking methods, like deep-frying where it is difficult to estimate how much oil is actually absorbed by the product, or for processings where there is food loss, like with drippings, when the drippings are not included in the final product. If you are not sure if your processing is adapted for calculation, it may be good to invest in a laboratory analysis and compare with the calculated values. In order to get the greatest accuracy in the calculation, you should use whenever possible the nutritional information of the producers of the ingredients you are using, instead of the nutritional analysis of the USDA that is included with Shop’NCook Pro software and that is often the result of an average. Note that you cannot use the nutritional information on the nutritional labels of your ingredients, as the values in nutritional fact labels are rounded and not precise enough to use in calculation. Instead, contact directly the manufacturer of the ingredients to get an accurate nutritional analysis. If you have to use the nutritional analysis of the USDA for your ingredients, make sure that the nutritional information selected corresponds to the ingredient you are using. For example, the default nutritional information in Shop’NCook Pro for the ingredient “flour” is for “Wheat flour, white, all-purpose, enriched, unbleached”. If you are using non-enriched, bleached flour, you should use the corresponding nutritional file, like the one for “Wheat flour, white (industrial), 9% protein, bleached, unenriched”. Also, make sure that you are selecting the nutritional information for the raw ingredient and not the cooked one, even if you are cooking it in your recipe, because the quantities in your recipes are specified for the raw ingredients and not for the cooked ones. For example, you have a recipe that requires 1 cup of (raw) rice. If you were to use the nutritional information for cooked rice instead of the one for raw rice, you would only get the nutritional value of about 1/3 cup of (raw) rice, because 1/3 cup rice expands to one cup when cooking. You need also to be aware that the convention of Shop’NCook is that the quantities declared in the recipes are without refuse or waste. If the nutritional information of your ingredient specifies some refuse, make sure that the quantity in your recipe corresponds to the quantity without the refuse when the quantity is given in weight or volume. For example, the default nutritional information for “chestnuts” is for “Nuts, chestnuts, european, raw, unpeeled” and includes 26% refuse for the shells. Make sure that the weight specified in the recipe is for the shelled chestnuts. Otherwise you need to correct the nutritional information for the chestnuts by setting the refuse to 0 (zero) and lowering each nutrient value by 26%. See here for more information (than you ever want to know) on waste in costing and nutritional analysis calculations. According to FDA compliance guidelines, the nutrient values of naturally occurring “good” nutrients (that is vitamins, minerals, protein, total carbohydrate, dietary fiber, other carbohydrate, polyunsaturated and monounsaturated fat, or potassium) must be at least present at 80% of the value declared on the label. The nutrient values of “bad” nutrients (that is calories, sugars, total fat, saturated fat, cholesterol, and sodium) must not be present at more than 120% the value declared on the label. They don’t specify a limit of how much the actual values of the “good” nutrients can exceed the label values, or how much the “bad” nutrients can be under the label values, except that the discrepancy needs to be “reasonable”. The bottom line is that you are safer to declare too much of bad nutrients and too little of good nutrients than the other way around. Shop’NCook does not take into account the nutrition loss due to cooking. You need to apply yourself some corrections to the nutrient values if you cook your ingredients. To correct the nutritional analysis by the values specified in this table, multiply the calculated nutrient values by the given factors. A question for you: Do you want Shop’NCook Pro to correct the nutritional analysis for loss during processing? If there are enough requests, I can add to Shop’NCook Pro the possibility to correct automatically the nutrient values for the type of processing or cooking. If you are interested in this feature, please let me know in the comments. Before calculating the nutritional analysis for food labeling purpose, make sure that the recipe is appropriate for calculation, for example does not have difficult-to-estimate losses or gain of ingredients during processing. Whenever possible, use the nutritional analysis of the producers for all your ingredients, otherwise check that the nutritional information used by the software corresponds to the ingredients you are using. Correct then the nutrients for loss during processing. In case of doubt, it is better to underestimate the quantities of the good nutrients and overestimate those of the bad nutrients. Once you have determined the nutritional analysis, use our free online nutrition labeling tool to create the label. UPDATE 31 March 2016: Health Canada has published a comprehensive guide on how to make a compliant label. Although it is meant for Canada, the statistical considerations apply for the US as well. DISCLAIMER: The information provided in this article is for informational purposes only, which should not be construed as legal or accounting advice. You should seek independent professional advice from a person who is licensed and/or knowledgeable in this subject before acting upon it. This is a great thing. Myrecipes contain vanilla extract that is cooked for two minutes prior to completion of the cooking process. Does your software account for the cooking off of the alcolol in the cooking process? you can correct the result yourself using for example the USDA nutrient retention factor table. When do you have to do these nutrional labels? Right now I am going to sell locally. I see products some stores that dont have this on their packaging. After viewing your information, I’m very interested in your software but I’m selling baked goods so I’d need the processed nutritional values….can’t do without them. After reading above, I’m still unclear if there is a print feature where I can produce labels that will satisfy the FDA labeling requirements. Can you please let me know that? Thanks! Shop’NCook Pro software can compute the nutritional information for the label. To print the label, you can then use our online tool at http://www.shopncook.com/nutritionFactsLabel.html . Make sure sure however to correct the values as needed to make the label compliant. Health Canada has published on this subject a comprehensive guide. I need to label my gluten free mixes. Do you have Sorghum flour as an ingredient? Yes, sorghum flour is a predefined ingredient in the software. Will this be able to compute for me gluten free flours, sugar free ( in many ways), and organic foods? I only have to provide nutritional label information on items I make a claim on, such as gluten free or sugar free. The database does not contain for example gluten free flour, but you can add any ingredients you need to it and either import the nutritional information from the USDA database, or input your own in the software. I found your website and trying to understand if only using your software we will be able to add the nutrition facts in our products. We produce salads, with fresh vegetables. Detail: we are locate in Canada and only seling for Ontario. 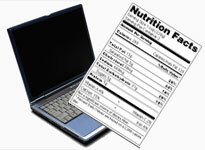 At the time being, our system only allows you to create US nutrition facts labels. Support for Canada should be however added in the near future. I have created a new bilingual nutrition facts labelling tool for Canada. I’ve been trying to use SCP for a number of weeks now and keep getting frustrated and giving up. What I REALLY need is a couple of features: 1) NUTRITION LABELING, NUTRITION LABELING AND NUTRITION LABELING. 2) Product scaling 3) product costing. Quant/serv column says 1/4 cup, next column is Quant/serv . . . and says 56.0. Looks like both columns should be resizeable (but are not on my MAC) what are these two columns? Ingredient “As Purchased” window. What is the Unit Information window all about? Shouldn’t these be standard conversions? It seems that the Ingredient quantity (in the recipe) has to be entered first before nutrition info is entered? Is this Correct. finally I have two granola recipies that are identical except for one ingredient. Can I create the first and then simply duplicate it and change the one ingredient in the 2nd and have all of the costing and nutritional info come over? Sorry, I only saw your questions now. For a more timely customer support, please use the helpdesk by clicking on the “Ask Us” tab on the side of the screen! The first quant/serv column is the quantity as specified in the recipe, the second one is the same quantity converted to grams. I have finally made a bilingual nutrition facts labelling tool for Canada. You can check it here. I make fudge and am trying to start my own sweet shop, so having the nutritional value of cooked ingredients would be awesome! And I love the fact that you have a tool to make my labels. Thank you very much!!! I am developing a new nutritional product which is a mixture of 3 different ingredients with a ratio of 79% main ingredient, 13% second and 8% third ingredient or 370 g /50g /30g, what is your advise to get to the right nutritional label? all these ingredients are natural unprocessed raw grains. If you have access to the detailed nutritional analysis of your ingredients, calculation will give as good a result as laboratory analysis since you don’t have any nutrient loss in your preparation. Make sure to ask the producer of your ingredients for a detailed nutritional analysis. The analysis provided on the nutrition facts label are not good enough, since the values are rounded. If they cannot provide it to you, consider using the nutritional values from the USDA database, as they are based on an average of nutritional values of many producers. If you use Shop’NCook Pro software, you can directly import the nutritional values from the USDA database, if the ingredients are not already in the software. 2 questions- editing a recipe- I can seem to add an additional item to a recipe- it allows me to add a line but doesnt add it to the recipe- do I need to recreate a recipe to include additional items- 2nd questions- can you suggest a label template that shows mix and prepared columns. To add an item to an existing recipe, edit the recipe and click on the “Add Item” button of the toolbar. Also, make sure you add the item on the Recipe tab of the recipe and input the information (ingredient quantity and name) before switching to the Shopping Item tab. I do some consulting for small mom & pop juice bars in Canada. Raw juice production creates a lot of fibrous “waste” after pressing. How do u subtract the waste values from the good stuff in making a nutrition label. The USDA database only contains “all-in” produce data? Calculating the nutritional information from recipes is often not appropriate when you lose (dripppings) or gain (deep frying) nutrients during processing, unless you can measure exactly what is gained or lost. In the case of juice however, the USDA database contains the nutritional analysis for many different juices. I recommend you to use directly this information, instead of the nutritional analysis of the raw fruit. I have just published a bilingual nutrition facts labelling tool for Canada that can be of interest to you. You can check it here. Hello, I had been using your software since almost 10 years and I am always pleased. However along this time I deleted the Sopping list items long time ago because I didn’t needed them since I had to edit recipes in other language. Now I Do need to have the Shopping list items in english and because I need the nutritional info, but it will take me for ever to edit it myself. Could you please tell me how could I re install that info. Now I am running version 3.4 and can not upgrade to the latest version. I kindly ask you for support on this matter, thx. If you deleted the database of grocery items by throwing to the trash the file T1.snctem in folder Templates, it will re-create it from the default the next time you start the software. Before you delete the file, make sure however to make a BACKUP of the folder Shop’NCook Pro 3.4 and that you exit the software if it is running. Note that you will lose however all the customisations you did to your database of grocery items – including any ingredients and nutritional information you have added over the years to the software. Note that version 3.4 is over 7 years old. I really recommend you to upgrade to version 4.0. You may also have the possibility of importing back the deleted grocery items when you upgrade, without losing your customisations.